A very attractive and delicious purple kohlrabi. Very easy to grow and very versatile. Kohlrabi is the queen of the cabbage family. Sow one seed per module about 1cm deep and about 4 weeks later plant out. The common name derives from the German – Kohl meaning cabbage and rabi meaning turnip. 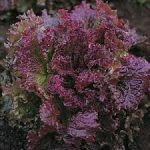 In this type of cabbage the stem remains very short and swells just above ground level to form an edible corm. 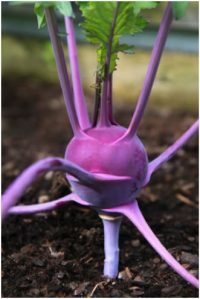 Kohlrabi is one my favourite vegetables to grow and in a tunnel or greenhouse you will get such fantastic early crops from late winter/early spring sowings. There is no point growing them indoors later on when they will do just as well outside. Kohlrabi requires an open, unshaded place. 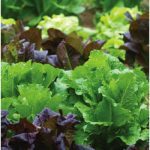 The soil should be reasonably fertile, free-draining and with a high water holding capacity. A regular water supply is necessary. Kohlrabi can be sown in modular trays which usually are placed on a heating bench at 15-18ºC in a greenhouse or tunnel. I sow one or two seeds per module about 1.5cm deep. The seeds usually germinate within 5 to 7 days and are ready for planting out about 4 weeks after sowing. You can make the first sowing in late January and then again in late February and late March. The sowing in April can be planted outdoors in May. A spacing of 30 x 30cm will give you decent sized kohlrabi. If you prefer smaller vegetables you can space them 20cm apart in the row and 30cm between the rows. Kohlrabi is an exception in the cabbage family. 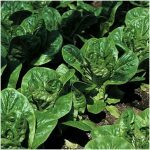 It is the only member that cannot be planted deeper than it was in the module and it should never be earthed up. If the soil touches the bottom of the corm it will rot. Apart from regular weed control and watering there is nothing else to do. The corms can be harvested when they are the size if a tennis ball. It is often quite untrue that larger corms are tough. If your plants grow steady and become big they should still be fine. Tough, woody corms develop when the plants are stressed through a lack of nutrients or water. This rarely happens in a tunnel or greenhouse. Kohlrabi is best harvested as required. It will keep for about two weeks if placed in a plastic bag in the fridge. Apart from the usual brassica problems, kohlrabi is sensitive to bolting especially if the temperature drops below 10ºC for two to three days. This can be avoided by using bolt resistant varieties. You will get 15 kohlrabi from one square metre.